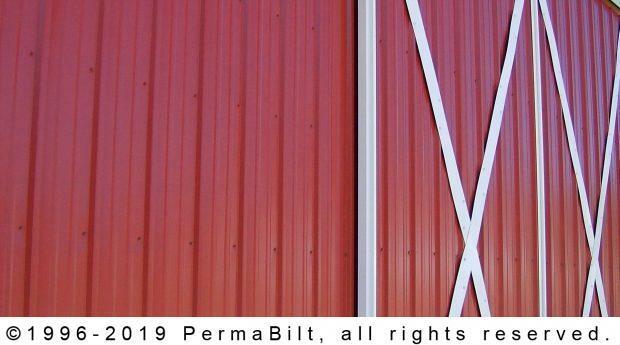 Walk-in doors: 3’ x 6’8” PermaBilt® door with self-closing hinges and stainless steel lock set. Windows: 5’ x 4’ standard vinyl window with screen. 18” eave and gable overhangs on 3 sides. 24” x 24” cupola with horse weather vane. With hundreds of designs to choose from, some of our customers can get stuck as to what exactly they want. That’s why so many appreciate it when our PermaBilt® Building Representative stops by on appointment and gives them a free consultation. 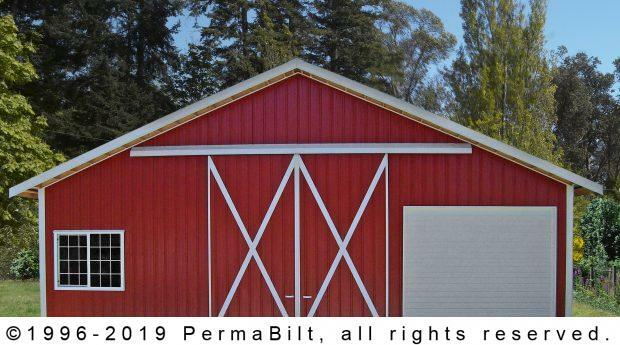 Based on a wealth of knowledge and experience in the post frame pole barn construction business, our Building Reps have seen just about every type of building. They are ready to make recommendations on a variety of options. Case in point: Our Marysville Washington customer wanted a garage to house his camper and car, plus some room for a workshop. When it came to what type of design, he liked the idea of his garage looking like a barn but functioning as a garage. And to keep the illusion going, for access to his camper, he chose sliding doors with decorative cross hatching. Each sliding door is something that PermaBilt® prides itself in because each one is constructed on site to assure the best possible fit. Additionally, every sliding door comes standard with aluminum side rails, aluminum bottom guides, handles and latches. For his car, he chose a commercial grade ribbed face steel roll up door. Similar with same type of craftsmanship in the walk-in door, windows and other accessories, our customer was very pleased with the end result.